My Living Work of Art, January 2014 in Review. Hey guys, it’s been while. A very long while. This piece isn’t going to be a very thoughtful post, not yet, just a look back at the last two months, mostly January as the title implies haha. So December and January were both full fledged holiday months, no work, no stress, just travelling, family & fun… oh, and some reading haha. The first 24 days of my holiday was all about London (featuring Manchester) and it was amazing, the best holiday i’ve ever had, but more on that another time, today is about January and how things played out for the first month of 2014. There was a lot of laughter, fun and singing, almost all hindi/punjabi based. At one point the younger ones in the family decided to takeover by breaking into a very out of tune Bohemian Rhapsody! There was a lot of amazing food, I finally tried #nasiKandarTelekom! I finally finished Feast for Crows and Dance of Dragons! Oh, and there was this amazing night of performance at China House! Say It Like You Mean It, #SILYMI, i think the next one is happening on the 21st weekend or something, be sure to check it out cause i had a great time in awe of all the talent. So yea, January was a very family month and it was great! But now it’s time to Move Forward and get back to my Systems, especially back to my running and nutritions systems. Time of get back to writing, i’ve taken a long enough hiatus and i’ve missed this. Time of take the next step with regard to my love for coffee and my future plans. For the next 60 days (till i get back to uni), my #1 priority is going to be to take my fitness to the next level, followed by getting back to writing and coffee. Anyway, I’ve made great progress over the last 6 months, moving from 2KM, 12 minute treadmill runs to my peak of 10KM in 50 minutes to my current 6KM in 30 minutes, and all-in-all losing 10KG but more importantly, feeling healthier than I’ve ever felt, especially since Fibro. As John W. Gardner said, “Life is the art of drawing without an eraser” and I like what i’ve drawn up for January with all it’s mistakes, highlights & colour. 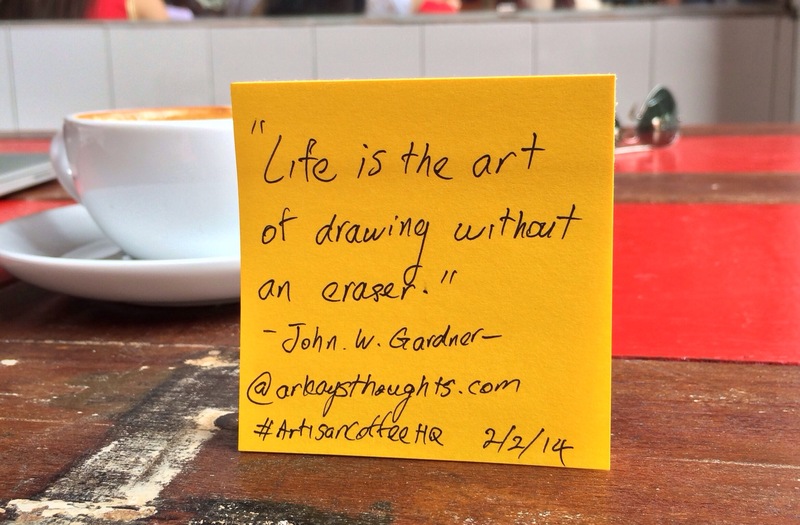 I look forward to coming back here to #ArtisanCoffeeHQ in a month to review and admire my February drawing. 🙂 I expect to see more prominent fitness, health, writing & coffee accents, colours and shapes. Next Next post: Arkay’s QOTD – Bill Gates.